For weeks I've been working diligently on finishing the Courtesy Flags we may need in the next year. 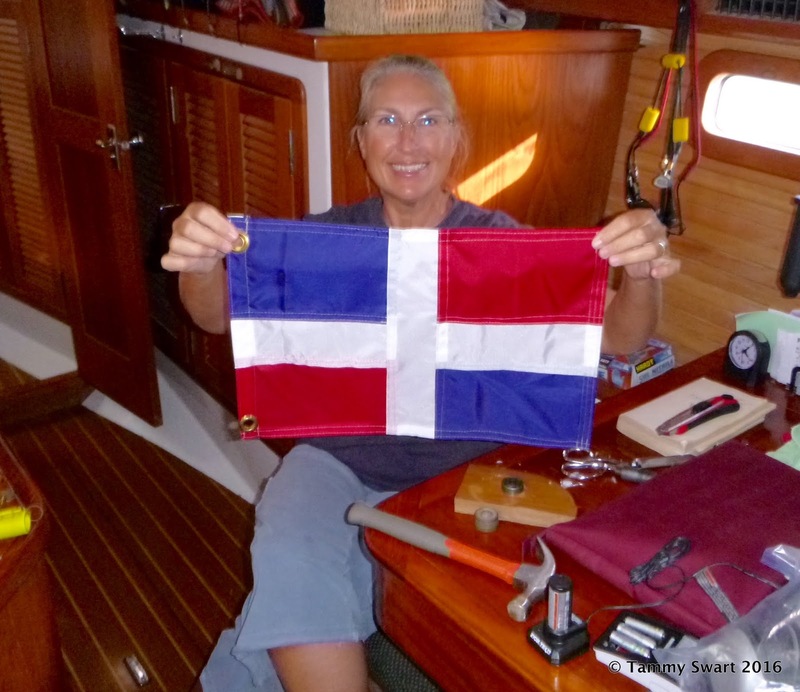 We plan to follow the island chain down south to Trinidad and Tobago, and then hopefully continue on into the Western Caribbean. 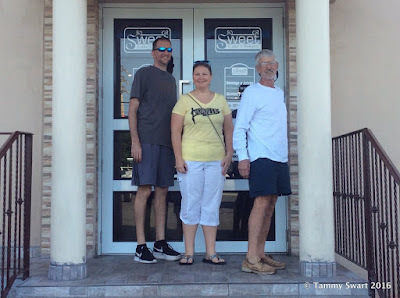 Our prospective goal is now Panama! And we now have a Flag for every country between here and there! 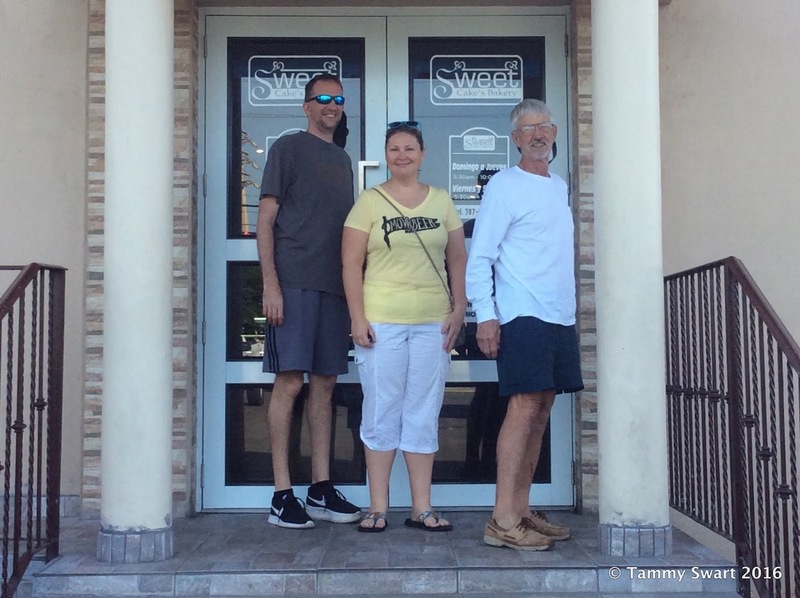 Last summer before we left Florida, I took delivery of supplies and instruction booklet from Sailrite. I already had things like pins, fabric markers and paints, needles, hot knife, grommet installation tool and the sewing machine on hand. Here is a list of materials ordered for the flag project. Hot knife blade for making grommet holes. You don't have to have this but it makes grommet installation so much easier. Starting out I made the flags for the Dominican Republic and Puerto Rico. The material is a little bit difficult to work with so I used basting tape to hold two panels together for stitching. I don't know if it was just hot and the tape got melty... or if basting tape is just known for gumming up needles, but after making the first two flags, I abandoned the use of basting tape in favor of about a million straight pins. The Puerto Rican Courtesy Flag was the first sign of trouble... There was no mention in the instruction book that there are two different versions of the flag, and that both are in use. A chance comment I overheard clued me in. We made our flags using the darker blue triangle... but looking around, I noticed that some were using a lighter blue. Much later in our stay in Puerto Rico, I asked a friend who lives here about it. He explained that the darker blue was used by people who approved of the liaison between Puerto Rico and the US... the lighter blue was flown by people who preferred Puerto Rican independence Being as the same flag design is used both as the courtesy flag for boaters like us, AND is the national flag for Puerto Rican citizens... I was unsure as to which flag to fly... but I guess since we are US citizens and have enjoyed the connection - we will go with the darker blue and fly it proudly! Wonderful memories of that day back in the Bahamas with Sally! The instruction book has size appropriate patterns for the different stars for all of the flags! Once I had the hang of folding the panels together to make alternating flat felled seams, flags like France, Colombia and Venezuela with three simple panels were a breeze. Well, at least they should have been. I have been fighting with my machine again. Somehow I've got the thread tension out of whack and just can't seem to get it adjusted correctly. The mystery is that when I use the white thread, it sews along like a dream... but when I changed to black thread, which is slightly more heavy, it made loops on the top... Well, after sweating profusely and swearing like a sailor for about half a day, I finally got it adjusted and things went much more smoothly. My speed and proficiency increased with each flag... I decided to get creative in the middle and use white thread on top and black thread on bottom to better match the panels... but after doing a couple of flags that way, I abandoned that madness... It's just not worth the extra hassle of rethreading the machine so often. Beautifully done Netherlands Antilles NO LONGER USED!!! The most heinous error I've found is that the flag for Netherlands Antilles is no longer used. I heard this from another Cruiser and when I went looking for information, it was difficult to find. I'm still not sure what to do about it. Some say that they are still flying this flag... Others say that it is proper to now fly the country flags of Sint Maarten and Curacao. In this discussion I found that the flag for Martinique is also flown in addition to the French flag... which is another thing altogether! For these I guess we will figure it out when we get there... as these patterns are not in the book! 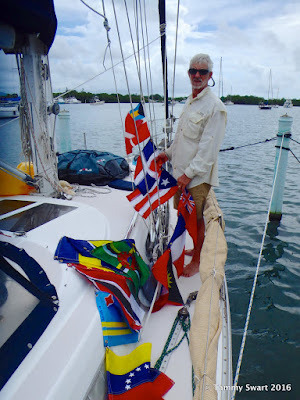 Luckily I learned my lesson (after finishing the flag for Netherlands Antilles) and consulted the internet to verify that the other flags are correct. The complicated emblems on some flags are too intricate to be done with material. For these I am using the sticky ensign material ordered, and either fabric paints or waterproof fabric markers to fill in the colors. The book has patterns to be traced onto the white ensign material and then cut out and colored in. The only one I made that was intricate was Dominica. I cut the red circle out from the red ensign material, then the small stars on the white and colored them green. I found the pattern in the book to be a little too simplistic so I copied flags I found online for a little more detail but this is an optional step. It took me two days to finish the birds due to drying time for the paint. I actually did end up putting the emblems on upside down and had to remove them and replace them correctly... My mind was boggled by the time I was done! I worried that the material would be less sticky after being removed so I sewed a zig-zag stitch around the perimeter of the red circle. I found that the instructions for some of the more difficult flags didn't provide the most efficient way of putting the pieces together... St Lucia was that way... The instruction kind of said that you could just crease the hems of all three triangle pieces, line them up on the flag front and back kind of freeform, and sew them on. I felt that making the triangle pieces one first by stitching them together and THEN placing the two parts onto front and back made it much more easy to sew them onto the flag. Making the pieces match one another took a lot of trial and error. As the days marched on, my pile of flags was growing... It was actually becoming kind of fun using my Cruiser Brain to figure out the parts and pieces... A little bit of a challenge now and then is good for me! Grenada was another of those challenges... The triangles again!!! Luckily they didn't have to be exactly the same to match up in the center because the small red circle covers the offset... 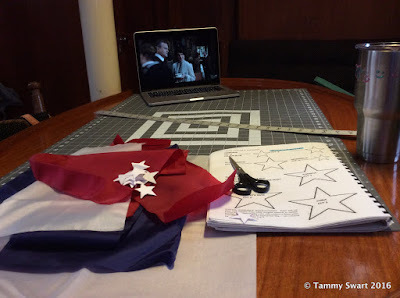 The stars were cut out of the white ensign material and I used fabric markers to color them yellow. Same with the little nutmeg symbols... two mirror images in white, but then I cut the little nut out of the red ensign material. I thought that if I had used red fabric marker, it would bleed into the yellow and look messy... This way it's nicely well defined. 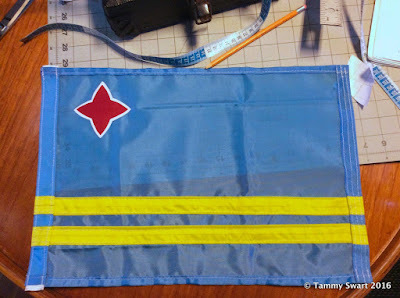 Dwindling down on the list... Aruba was another easy one and is the only flag I made that used the light blue material. So when I made Trinidad and Tobago I tried to fix this. It was touch and go there for a while as to whether or not I would have to completely remake the diagonal parts. If you zoom in on this photo, you can see white zig-zag stitches at the top border of the black material. What I did was pin both pieces of the diagonal panels onto the red flag body and then I cut off the parts that extended past the edges. I'm not sure if that really makes sense but if you make this flag you can kind of understand what I did. The zigzag part is where my seam joining the pieces back together wasn't quite robust enough so I tacked it down with a zig-zag. I didn't have to do that on the bottom end as I stitched it better. 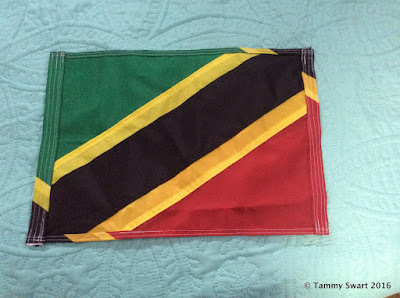 I guess I didn't take comparative pictures of each side... but they look more identical than the two sides of the St. Kitts & Nevis flag shown above which show the mismatched stripes. Anyway... Moving on around to the Western Caribbean... Last on the list was Panama. This was another flag that might look easy, but I'm an expert now and I don't need no silly instructions... That's a good thing because there weren't any! It took me a bit of figuring to make the pieces fit together using the proper seam joins and yet still have the panel colors line up perfectly... But I got it done and if you save this flag for last, you should be able to do it as well... The only mismatch that couldn't be helped was the hoist and fly where the colors curl around and overlap... dratts! 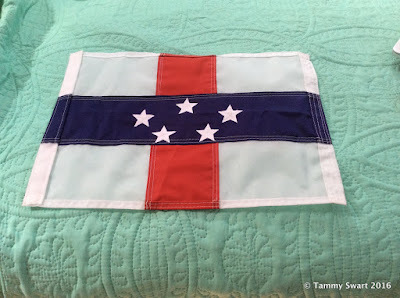 I could have created new handmade US and Texas flags... or maybe a ships ensign for Dos Libras with our symbol on it... but let's get real here folks! I've been sewing these things for most of two weeks and I still have other projects that need doing before we leave here. And time is growing short! So I got out the grommets an the hot knife... and spend most of a morning installing grommets onto the hoists of 17 flags! Using the special tip for the hot knife for making holes.. I carefully marked the position of each grommet. It takes great concentration and a steady hand to burn the holes through the fabric without melting too much. It's delicate work but with practice it began to go faster. You could probably figure out a way to make the holes without the hot knife using a punch of some sort, but some of the material you have to go through is very thick so it would be difficult. Installing the grommets is easily done with the right tools and it went pretty fast as well. 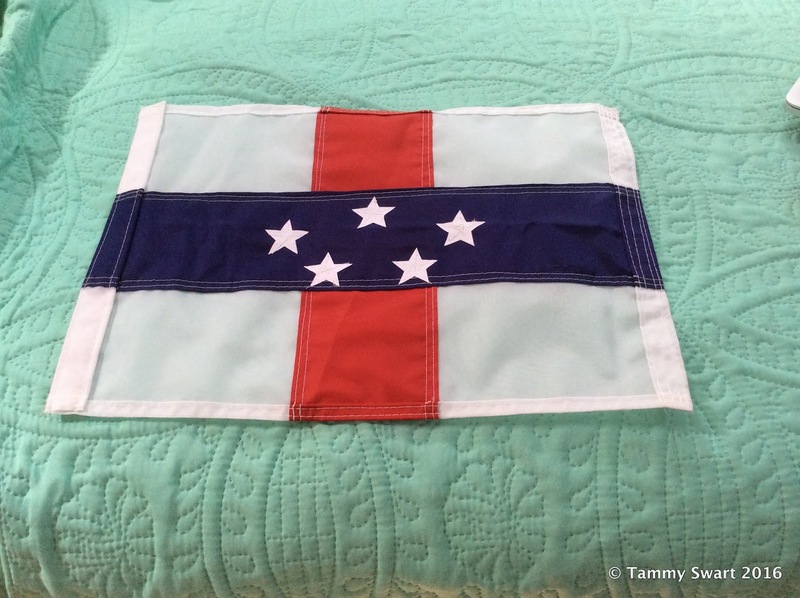 The first two flags I made were done with larger-than-recommended grommets that we had on hand. I don't advise this, use the smaller grommets. They work better. Once I had the grommets done, I used fabric paint to label the flags and point which way is up. This is an extra step and maybe unnecessary, but I didn't want to have to dig out the book every time we hoist a new flag... 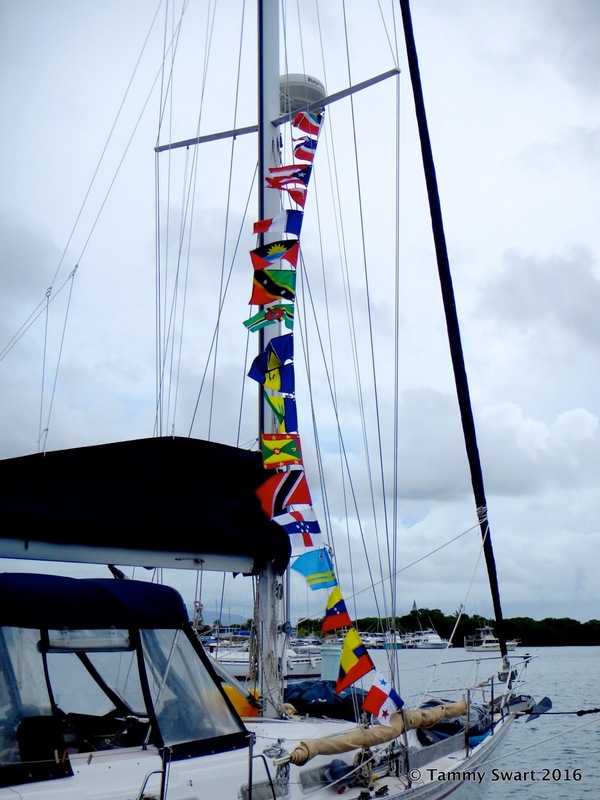 I used paint which took an extra day of drying time before I could run all of my flags together up the halyard for the ultimately triumphant photo op! 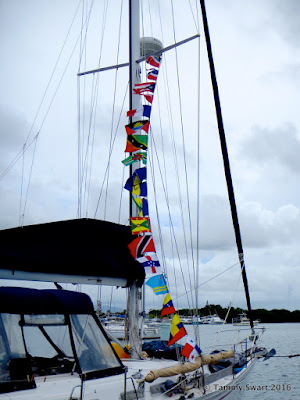 Before we took off cruising, I searched the internet and blogs to find out where people were getting their courtesy flags. There wasn't much mention of it outside of other people who made their own, or the occasional coup found on Ebay or somebody selling off their stock. Some people are buying the really cheap stick flags and altering those to go up the halyard... I applaud their thriftiness and ingenuity but I just couldn't do that. Our Bahamas flag was store bought and although it cost $19.99 at West Marine (and only $10 in the actual Bahamas) the quality is extremely poor... we replaced the Bahamas flag three times before we left there the second time. I made my flags using the Sailrite LZ machine, with size #16 needle. But these flags could well be made on a non-commercial machine so give it a try! Was it worth it? Buying the flags online can cost between $19.99 and $49.99 if you don't go the stick-flag route. My materials cost in the neighborhood of $150 because I already had some of the supplies needed... and I still have supplies leftover...but I would say that I have a full set of very sturdy flags that will withstand the elements far better than the machine made flags. If they do get torn up I can repair them... And I had fun making them. And this concludes all I know about making your own Courtesy Flags! Unfortunately I don't know of an instruction booklet for other flag groups... if you do, please share in comments! The key for me was your comment that although you are using a Sairite, a regular commercial machine could make them. Whew! I was worried because a couple of times you refer to how thick the fabric is due to folding and layering. I wonder if my little Brother Runway could handle it. On the other hand, you had to make a lot of flags. We will have fewer to make. I do think a regular machine could do this, at least mostly. Yes, there are some really thick spots... the ones with a stripe that folds into the edges and has to be tripled on top of a seam that is quadrupled might be a challenge, but I think you could work something out. Take a look at the flags you're making, maybe you'll get lucky and they won't have any bulky stripes. Good luck finding some sort of pattern, it must be out there! Beautiful job on these flags! I don't sew, so I'll probably be using those waterproof markers. Thanks Cheryl! I'm really happy with how they all turned out... and I'm really happy that I'm DONE! Wow! That's a lot of flags. They look awesome. Great job. Thank you! It IS a lot of flags!